Eventually Vicki moved to Adelaide and made invaluable contributions as a team member with OXFAM, New Internationalist, OXFAM Shop and OXFAM Travel. 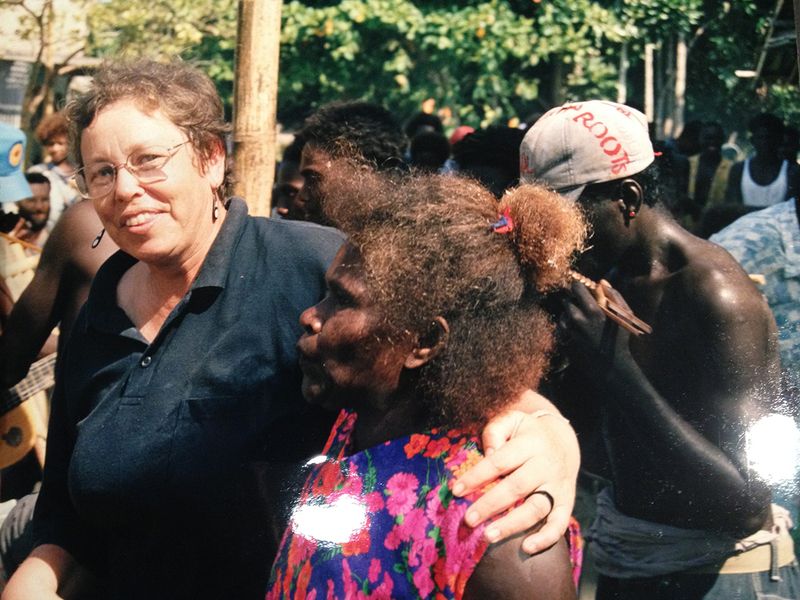 But for Vicki it was never enough; she always wanted to make a practical and tangible contribution to global justice and environmental justice, so on several occasions she worked for years as a volunteer in the Solomon Islands and PNG, firstly with Australian Volunteers International, and subsequently with the World Wildlife Fund (WWF). Her contribution with WWF in the Solomons was so typical of the fearlessness and great clarity that she brought to everything she did. For many Solomon Islander communities, tourism was a significant source of income, an important alternative to logging that causes so much environmental damage and land-ownership conflict. But in the year 2000 tourism had collapsed because of security concerns following the political crisis and lawlessness that blew up in the late 1990s due to a long history of centralisation of development investment in Honiara, and land-alienation in the regions. Despite the security concerns, Vicki saw an opportunity to build an alternative income base through eco-tourism, and patiently set to work to plan and initiate tours that truly gave participants an experience of the rich cultural and environmental heritage of the Solomon Islands. In the process she built life-long friendships with many Solomon Islanders; there are even children who’ve been named Kalgovas in honour of the love and respect that she earned. At home Vicki was very much the social glue in the community too, often initiating a meal together with activists and friends in her Semaphore community and with her previous workmates. Our team at the New Internationalist want to recognise particularly her superb volunteer work with us in recent years. She was eager to ensure that students and library users could be exposed to an experience of life beyond the confines of Australian culture, so she patiently contacted hundreds of librarians around the country, introducing the New Internationalist magazine to them. She died too young after bravely battling cancer for several years and will be hugely missed. This entry was posted in Activism, Asia-Pacific, Environment, Foreign aid and development and tagged Australian Volunteers International, AVI, librarians, New Internationalist magazine, obituary, Oxfam Australia, PNG, Solomon Islands, Vicki Kalgovas, World Wildlife Fund, WWF by Brian Loffler. Bookmark the permalink.